This is a must-have culinary guide for every cook keen to prepare and enjoy the authentic foods of China, the Orient and South-East Asia. From the well-travelled classics of Peking, Hong Kong, Singapore and Tokyo to innovative Sichuan specialities, delicately spiced Indo-Chinese fusions and the very best of Thai and Malaysian cooking, all the flavour and essence of the East is here. 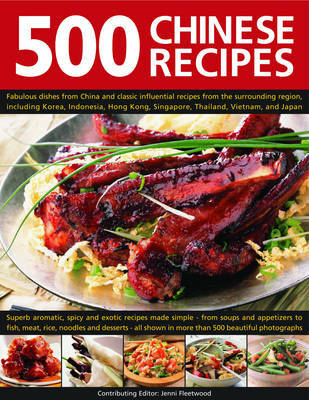 An illustrated reference section guides the reader through the kind of culinary techniques integral to the cuisine of China and neighbouring lands, from choosing raw ingredients to preparing stocks, sauces, glazes and marinades; wok-frying at just the right level of heat, steaming vegetables or whole fish, or simply achieving that perfect sweet-sour balance. The recipes also give advice on the kind of intricate touches that will give dishes real visual appeal, such as stuffing, rolling, skewering and parcelling. 500 illustrated recipes will inspire the reader to try out meals for every occasion, from spicy, fortifying soups such as Udon Noodles with Egg Broth and Ginger to light, dumpling-style snacks such as Steamed Crab Dim Sum with Chinese Chives. Try out great new ways to prepare poultry, from the speedy Honey, Orange and Ginger Glazed Poussins to the leisurely Pot-Cooked Duck and Green Vegetables. Among the many fish and vegetable recipes, you'll find dishes with universal appeal such as Steamed Fish with Chilli Sauce, or a lesser-known, lightly spiced stew of Braised Aubergine with Courgettes. Many of the Indo-Chinese influences will make delicious al fresco options and all are bursting with colour, aroma and visual appeal. With concise, step-by-step recipes organized by meal type and chief ingredient, plus up to 500 appealing photographs, this is the most accessible guide to Chinese and Eastern cooking of its kind.